It’s right there on your plate at Mikuni: a bright green leaf that looks like nothing more than a pretty garnish. Your instinct might be to push it aside without giving it another thought, focusing instead on the more interesting fare in front of you. But we have a better idea—and a very beneficial one, to boot. Perilla, a member of the mint family, is a perennial herb that grows in Eastern Asia. 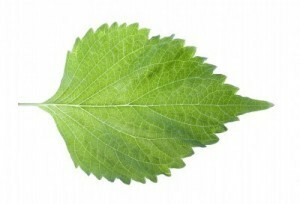 Different cultures have different names for it, but in Japan it is known as shiso. The leaf’s medicinal qualities are widely touted and have been used for centuries to promote better health. It is a rich source of omega-3 fatty acids—essential nutrients that build brain cells, control clotting, and have been reputed to offer protection against heart disease and stroke. Since our bodies cannot produce omega-3 fats naturally, we must look to food sources to ensure that we have sufficient supply. So the next time you’re tempted to nudge that shiso leaf to the edge of your plate, think again. Take a bite and let the fresh flavors of basil, fennel, and mint tease your palate—and let the health benefits of this amazing herb go to work for you.